Pick your own organic grapes! On the last Sunday of August, come to Nea Gonia with your friends and family. We will give you a basket and clippers and will show you how to pick your own organic Sultana grapes! 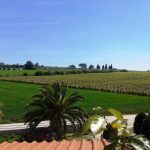 How does a 28-year-old vineyard look like? What does it mean to grow grapes organically? What do “soultanina” grades taste like? 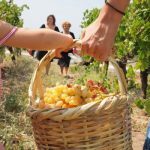 For the 10th year in a row, the Kazakis House of Viticulture opens its doors and its organic wineyards to the public. This Sunday, 26th of August, take your family and your friends and join us! 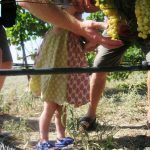 Take scissors and baskets and stroll around the wineyards. Pick your favorite bunch, chop it and take it with you! Then, you can visit the laboratory and be treated a cup of coffee or tsipouro (greek spirit). You will also be introduced to the facilities and get to know how the famous Marianna’s Vineleaves are being made. 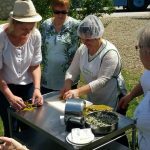 Additionally, you will have the chance to taste other traditional products that they produce like Marianna’s Grapeleaves, Marianna’s Ntolmadakia, Marianna’s Pies (or Pites).